Many pundits claim that the “dog bite” danger is incredibly overblown, because the so-called mastiff breeds, large dogs like labradors, boxers, terriers and rottweilers, are unfairly singled out as dangerous when, in the proper environment, these animals are really just large teddy bears. Alternatively, these pundits often argue that the dog bite victims are to blame because they either actively provoked the animal or consciously disregarded the potential risk. Those arguments may or may not be true, but the fact is that 1,000 people a day are treated at emergency rooms following animal attacks. Statistically, many of these victims are either older adults or young children, and these are the most at-risk groups for serious physical and/or psychological injuries from animal attacks. In some cases, dog bite victims only have rather minor injuries that are easily treated at an ER with non-invasive treatments and confirmation that the animal was not rabid. But in many other cases, animal attacks cause some of the worst kinds of personal injuries. Knockdown: If a mastiff or other large dog has a head of steam as it charges aggressively, it nearly always knocks the victim to the ground. The resulting broken bones normally require aggressive surgical treatment, and the resulting internal injuries can cause significant blood loss. Lacerations: Many aggressive animals bite and tear flesh, leading to serious cuts and lacerations that often require reconstructive surgery. Even then, the victim may have permanent scars. Emotional Wounds: Some victims experience flashbacks, nightmares, and other classic Post Traumatic Stress Disorder symptoms that only dissipate after extensive therapy; other victims develop severe zoophobia (fear of animals) or agoraphobia (fear of outdoors). Damages in dog bite cases typically include compensation for economic losses, such as medical bills, and noneconomic losses, such as pain and suffering. Punitive damages may be available as well, in some extreme cases. Statute: Victims only have to prove cause. They do not have to prove that the owner knew or should have known that the dog was dangerous. Negligence: In this context, negligence is a lack of ordinary care, such as failure to properly supervise the animal. Negligence Per Se: The negligence “as such” rule applies if the tortfeasor (negligent actor) violated a safety statute, such as a leash or fence law. Contributory negligence and assumption of the risk are the two most common insurance company defenses. If the victim provoked the animal, the victim bears some legal responsibility for the attack. Children under 6 cannot provoke an animal as a matter of law; otherwise, Florida is a pure comparative fault state, so the judge apportions damages based on the percentage of fault. 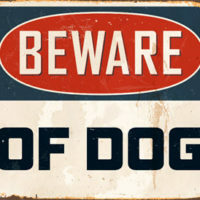 As for assumption of the risk, if the owner displayed a “Beware Of Dog” sign in a conspicuous manner, the victim was at least 6, and the attack occurred on the owner’s property, the owner is not liable for damages. For the most part, Florida has very victim-friendly dog bite laws. For a free consultation with an aggressive personal injury lawyer in Brandon, contact Reed & Reed. Home and hospital visits are available.